Ever wonder what goes on behind the scenes at a TV talk show? While viewers watch all the glitz and glamor on TV, back in the studio there's a very different atmosphere in the shadow of the cameras, where a dedicated crew helps create the magic of television. This is a day in the life of a TV talk show executive producer. 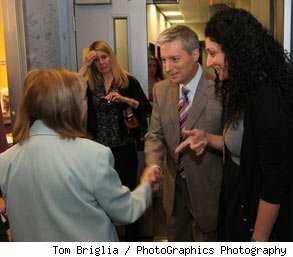 From booking guests and choosing segments, to meeting with crew and audience members -- Mina Sabet does it all. As the Executive Producer of "The 10! Show" on NBC 10, Sabet is on the go from the moment she sets foot in the NBC Philadelphia studios. "It's a lot of fun," Sabet says about her key role on the daily lifestyle show, where she's worked for a little over two years. "I'm very fortunate. I'm very lucky." Working in the fourth largest market in the country, under the leadership of the TV station's vice president of news, Chris Blackman, Sabet oversees the crew that works on "The 10! Show." 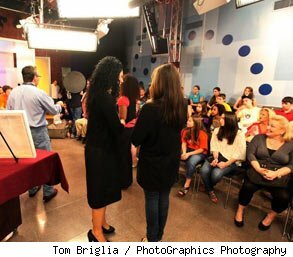 Offering a seamless lineup of entertainment segments, popular guests and celebrities, the show is broadcast throughout the Delaware Valley, reaching a little over 6 million viewers in Pennsylvania, Delaware and New Jersey. Watching the show, viewers may not be aware of the amount of work and planning that happens behind the scenes. "I think people think that working in television is super-glamorous and it's not really super-glamorous," Sabet explains. "It's very hectic and very busy and nonstop. And everybody is constantly running around, and there's not a lot of time to eat lunch or socialize." The fast-paced environment motivates Sabet to keep a high energy level, typically working intense 12-hour days. "It's very hectic all the time," she says. "We never have a chance to breathe; it's constantly moving." Juggling many different duties, a day for Sabet begins with a morning meeting at 8:30 a.m. with the staff, then a rundown of the show with its hosts at 9 a.m., before heading into the studio to set up for show time at 10 a.m. While taping, Sabet splits her time between the studio and the control room. Everyone communicates via headsets to ensure that things run smoothly. On commercial breaks, Sabet will help the production crew set up and break down the set, will prepare guests for their appearance, or go on a computer for last-minute changes to scripts or graphics. When the show is over, promos for upcoming shows are taped, then preparations for future shows begin and the cycle starts all over again. Maintaining open lines of communication and collaborating as a team are important components of the show's success. "It's very much a team effort," Sabet says. "We all come together after the show and we do a rundown meeting." With a quick turnaround, Sabet and her team move swiftly to direct their attention to upcoming shows as she delegates assignments to staff members, "We talk about what's coming up on the show, we divvy up what host is going to do it, and we talk about what is really the strong point of the segment: Why is it interesting to me? "Because the "Today" show has been running for four hours before us, doing a lot of the same stuff ... How do we make it unique to us? How do we make the show interesting to our viewers?" The show's time-slot schedules them against "Jerry Springer," "The View" and "The Price Is Right"; therefore, Sabet says, it's pivotal for her crew to grasp their viewers' interests -- upholding audience satisfaction and high ratings. "It's very light, entertaining. Any celebrities who are in the area, local or international, are here. We have a live focus as well, where we have a live reporter out in the field doing something kind of fun and crazy." Featured local guests include musicians, chefs and members of the community. The show also welcomes national personalities, receiving hundreds of pitches a day. Sabet says it's a never-ending process, "It's coming in fast and furiously all the time," she says. "If I don't check my email for 10 minutes, I have 100 new emails, and that's just the way it is all day long." Musician and composer David Foster recently made an appearance but wasn't scheduled to perform. Sabet and her team were aware of the situation but hoped he would change his mind after they ordered something very special for the occasion. Sabet recalls that day: "We had a grand piano delivered to the station and we really planned ahead to make it work so that he would see the piano and want to go and sit at the piano. And he ended up doing his interview at the piano and then he performed a song with the band we had booked that day. 'He worked it up five minutes before the segment and he played the piano while the guys sang and played the guitar." This memorable experience is only one of many in which Sabet and her crew got the opportunity to see their hard work pay off. "That happens a lot -- where we're just so thrilled about a show, because we work so hard every day to make these shows so good." Sabet began her career in journalism and production after spending a year in Southeast Asia working in wartorn Cambodia, Vietnam and Laos. Upon graduating from New York University's School of Journalism, she landed a position at the entertainment magazine show, "Extra," in Los Angeles. Sabet was part of the staff that launched the show. She was also recognized as one of the first in the industry to become a "predator," a producer and editor. Shortly after, she was asked to lead a staff of over 100 in launching a network that combined music and television in Nashville, Tenn. Sabet has also worked as a producer and writer for ABC News, CNN and Fox. Early in her career, she was among only a handful of women in her field, but now says times are very different. "It's definitely changed since I started in the business; there are a lot more women and a lot more women in managing positions." Having worked in the industry covering both entertainment and news, Sabet proudly says that her job at NBC 10 is a perfect fit. "I love the adrenaline rush of TV, just the overall relationship between the staff and myself. And I love putting out fires and fixing things and making things better. And there's a lot of challenges in the show, so I love really every aspect of it. But probably most of all: meeting people, seeing the show come together, come to life."